ESPN/TWC: One effect of the recent deal between the ESPN networks and Time Warner Cable has taken hold. Starting Monday, Time Warner subscribers gained access ESPN and ESPN3.com oniine from any Internet connection. We’ve tried it from a tethered cell phone, and though we wouldn’t recommend it due to bandwidth issues, it did work – give a take a pause or ten, and some pixellation. You don’t need to be a Time Warner Cable RoadRunner high-speed Internet subscriber… the system works through an authenticated login via TimeWarnerCable.com’s “My Services” section, where you have to sign up for a login (bring your cable bill for information when first registering). The online service is tied to TWC’s video side, not the Internet side. When we checked the ESPN3 schedule, we noted a lot of soccer and college football. We know at least one OMW reader who will use the service to keep track of a far flung college football team that is occasionally on ESPN3. As for the ESPN Internet simulcast, we tried it on a computer with a decent bandwidth, and it looked really good…they use the ESPN HD feed, presumably scaled down for online use, but it looked very nice on a modest-sized computer LCD monitor. Anyway, as noted, the TWC access to the ESPN networks (more than just ESPN/ESPN3 is “coming soon”) is a godsend for sports fans. You won’t get out-of-market pro games on it, since those rights are controlled by the various leagues and providers (i.e. DirecTV’s “Sunday Ticket”, and the various pay services for MLB, the NHL and the NBA). MCCONNELL TALKS: We’ve noted many times that though Cincinnati is now ably covered by Jeremy Moses’ Tri-State Media Watch, we still keep an eye on Clear Channel talk WLW/700 there…which is a station that impacts a large chunk of Ohio. Thus, we listened with great interest to a podcast by Margaret Larkin, also known as “Radiogirl”, who does media related podcasting in the Chicago market. Margaret sat down and talked with former WLW mainstay Mike McConnell, now holding down middays at Tribune talk WGN/720. McConnell’s interview is a “must listen” for anyone interested in radio in general, not just those who have followed his career from WLW to WGN, or those in the Cincinnati or Chicago markets. And he doesn’t hold back in his opinions on the state of the radio business, or even about his former employer. He doesn’t offer anything on the recent turmoil at his current employer, where former-and-again boss Randy Michaels is now again his former boss, but we don’t know when the interview was actually conducted. We do note that he quickly tells Larkin that he has a contract for “many years”, but doesn’t go into detail. And a note here: Larkin is actually employed by Tribune and WGN, though that’s not exactly a secret. Monday will be a big day at CBS Radio’s Cleveland cluster. On the heels of classic rock WNCX/98.5’s announcement that it will put “The Maxwell Show” in morning drive, sister hot AC WQAL/104.1 “Q104” has announced who will replace exiting morning co-host Rebecca Wilde, who is leaving the station to embark on travel. And it’s probably no surprise to anyone that Q104 afternoon driver Jen Toohey will make the move to morning drive, starting that same day, November 1st. That move had been expected from almost the moment that Wilde announced she was leaving the show once known as “Wilde and Fee in the Morning”. Like Wilde, Toohey has had quite a high profile in the local media, appearing on various local TV shows. There’s no word yet who will replace her in the “Q104” afternoon drive time slot. And we’ve been asked, and don’t yet know the fate of current WNCX morning drive co-hosts Scott Miller and Jeff Blanchard, who will be displaced by “The Maxwell Show” on Monday – if they haven’t left the building already. If they’re moving to another time slot, or to another role within CBS Radio locally (they probably wouldn’t be a fit for Q104, of course), we haven’t heard it. The move displaces former morning show host SCOTT MILLER. Reach out to this experienced on-air and programming talent with experience in both Rock and AC formats at (440) 840-1028 and mediamax (at) sbcglobal (dot) net. Jen Toohey joins the Q104 Morning Show! CLEVELAND, OHIO – WQAL, announced today that Jen Toohey will join host Allan Fee and the highly rated WQAL morning show on Monday, 11/1 as morning co-host. Toohey is currently the Afternoon Drive host on the station and has been with WQAL since 2004. The show can be heard on-air air weekdays 5:30 to 10:00AM and streaming live on-line at http://www.q104.com. Jen Toohey’s listeners have followed her through single life, “Jen’s Question of the Day,” advice from her Mom and her engagement. “We are so excited to have Jen bring her continuing life story line of marriage and family to the Q104 Morning Show,” says Dave Popovich, VP of Programming for CBS Radio Cleveland. Jen Toohey replaces Rebecca Wilde who after almost 10 years at Q104 has chosen to leave the station to travel the world. “Because Rebecca has been such an important part of the Q104 brand, it was imperative that we find the right person,” states Popovich. Here’s the latest on iconic Cleveland Cavaliers radio voice Joe Tait, who is preparing for heart surgery on this, the Cavs’ regular season opening day. He is now slated to undergo surgery next week (exact timing still to be determined), when he will undergo a double bypass, as well as replacing the aortic valve. Behind the Cavaliers Radio Network microphone filling in for Joe Tait tonight, and during the rest of his absence, will be versatile WTAM/1100 sports director Mike Snyder, joined by Cavaliers’ legend Jim Chones. CBS Radio Cleveland classic rocker WNCX/98.5 has just announced its pickup of a former personality at Clear Channel rock/talk WMMS/100.7. WNCX is announcing the radio return of Maxwell, who occupied the WMMS afternoon slot for several years until not reaching contract renewal terms with Clear Channel. Oak Tree replaced Maxwell with Alan Cox, whose mostly-talk afternoon drive show still airs on the station today. The WNCX release notes that Maxwell starts November 1st, and will be joined by previous cast members “Stansbury” and “Chunk”. CLEVELAND, OHIO – 98.5 WNCX…Cleveland’s Classic Rock today announced the return of “The Maxwell Show” to the Cleveland airwaves beginning Monday, November 1st . The popular show can be heard on-air air weekdays 5:30 to 10:00AM and streaming live on-line at http://www.wncx.com. “The addition of the Maxwell Show to the WNCX line up gives us a proven winner to start Cleveland’s workdays,” commented Bill Louis, WNCX – Program Director. Joining Maxwell is Stansbury, a Twinsburg native who for the last five years has brought balance to a man who truly needs it. Stansbury credits his minister father for screwing him up just the right amount to make for some serious entertainment. Rounding out the team is Cleveland native Tiffany Peck aka “Chunk,” whose love of fast food ultimately decided her radio nickname. A hometown girl, Tiffany brings a unique woman’s perspective to the show. WNCX, WKRK, WQAL and WDOK are owned and operated by CBS RADIO, one of the largest major-market radio operators in the United States. A division of CBS Corporation, CBS RADIO operates 130 radio stations, the majority of which are in the nation’s top 50 markets. Good Karma sports WKNR/850 “ESPN 850” and its low-powered brother station, WWGK/1540 “KNR2” have always had at least some sports talk competition in Cleveland…just not much on the radio. And, even less since Clear Channel talk WTAM/1100 deemphasized sports talk after canceling the weekday edition of “Sportsline”, in favor of a mix of topics on non-game nights with evening host Bob Frantz, not to mention afternoon host Mike Trivisonno’s move to more non-sports topics. Starting November 1st, a new online effort joins the battle, until now a space only occupied by Paul Belfi’s SportsTalkCleveland.com…itself, at one time, an adjunct of WKNR before going solo. “Digital Sports Network”, a cooperative effort with the Plain Dealer’s affiliated website Cleveland.com, could very much be the answer to the question “where are they now” for any number of Cleveland sports media personalities. That’s one question people won’t ask about some of “DSN’s” biggest names, at least if the schedule posted online holds true on November 1st. That schedule lists long-time local sports radio/TV talker Les Levine (Time Warner Cable’s “More Sports and Les Levine”) pairing up with PD sportswriter Bud Shaw in middays. We assume both men are keeping their regular gigs. Morning drive will be co-hosted by local sports TV veteran Mike Cairns, currently filling in at Scripps’ WEWS/5, and Bill Boronkay. Local sports radio veteran Matt Loede (Metro Networks, WEOL/930) is paired up with Greg Kozarik, and after Levine and Shaw, two other known names are listed in the DSN afternoon drive slot…long-time local and network sports radio personality Chuck Booms and former WTAM afternoon drive producer Paul Rado are listed with Harry Petsanis. We already knew that long-time/now-former WKNR voice Daryl Ruiter was joining the new operation…and he’s paired with another ex-WKNR host 6-8 PM on the DSN schedule, the one and only “BSK”, Kendall Lewis. Lewis, of course, also worked at Belfi’s SportsTalkCleveland operation. The stream will continue with local hosts until 11 PM, with the “Final Word” hosted by three more local sports radio names, Joe Lull (Metro Networks), and ex-WKNR’ers Bob Karlovec and Ken Silverstein. Note that all of the above comes directly from the new DSN online schedule, and we haven’t directly confirmed any of it. It seems unlikely, though, that Cleveland.com would put up a fake schedule. Now, when we first heard about this effort, it was a blog and not affiliated with Cleveland.com. When “DSN” launches, will the mix of familiar names and newcomers be enough to help it gain traction? Is the Internet to a point that an online operation can make some hay in the local sports marketplace, and how will Mr. Belfi’s existing operation be affected? Your Primary Editorial Voice(tm) is back and in the OMW Saddle again. We appreciate our new “Second” for keeping the OMW fires going while we were away from the Mighty Blog(tm). NEW SIGNAL: That forlorn FM translator that started life in Lorain, but didn’t actually start, and was set to go to Radio One…will go to Clear Channel, maybe. The folks at Oak Tree, as reported in numerous places, have filed to purchase W262BN/100.3 Lorain, which had a construction permit to move to the North Ridgeville area with a city of license of…Cleveland. 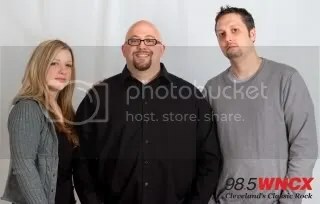 As we reported, the effort to move the translator closer to Cleveland, by owner Edgewater Broadcasting, was shot down by Media-Com talk WNIR/100.1 Kent, with “The Talk of Akron” listeners responding to a station call for letters to the FCC asking for rejection of the move. Radio One filed to buy the facility for $100,000…and Clear Channel is getting a bargain relative to that price, $85,000. Radio One bailed out of the purchase after the move, and another attempt to relocate the translator to 99.1, were both turned away by the FCC. The Clear Channel purchase application notes that W262BN, still legally licensed to Lorain, will rebroadcast Clear Channel country WGAR/99.5 Cleveland, but no one believes that’s the end game. 1) The station becomes a simulcaster of talk WTAM/1100, aimed at putting the station’s sports properties on an FM central city signal. This is what Clear Channel already did in Minneapolis, moving a translator into downtown Minneapolis to simulcast sports KFAN/1130 “The Fan”. The biggest advantage to doing this would be to put Indians and Cavaliers games on FM in the downtown area, and the translator (even maximized to 250 watts) would be a “helper”, not marketed as a full-fledged incarnation of WTAM-FM. 2) The station mounts an entirely new format, fed by the HD2 channel of an existing full-power Clear Channel FM station. We’re having trouble figuring out what format CC would choose. AAA was a format hole for such a niche signal, but is no longer, unless the company wants to nip Elyria-Lorain Broadcasting’s WNWV/107.3 “V107.3” in the bud. Clear Channel could also mount a competitive format to another station to try to chip away market share, to help the company’s existing stations. One thing appears certain: no one is at the betting window for an actual simulcast of WGAR in Lorain County. What about the problem of moving the station’s signal? SPEAKING OF OAK TREE, AND WTAM: One of the biggest stories in the radio world this past week is the official end of the Randy Michaels era at Tribune. Though we would not bet the OMW World Headquarters on the fate of Metheny or others in the Randy Michaels orbit at Tribune, we cautiously remind people that “sweeping changes” seldom happen as fast as envisioned on message boards and the like. HER EXIT: Rubber City Radio country WQMX/94.9 evening personality Amanda Casey is finishing out her last week at the Akron market country powerhouse. Casey’s last day will be at the end of this week. OMW hears she will be physically heading out of the Akron market, but hopes to resurface somewhere else on the air soon…or perhaps off-air as well, doing consulting work. We hear Amanda has programming experience in the Western U.S.
We haven’t heard yet if anyone has been picked to replace Casey, though we did spot OMW reader and WQMX program director Sue Wilson looking for a possible new replacement in the nighttime time slot in an AllAccess item. No, it’s not the antenna that Local TV Fox affiliate WJW/8 has sorely needed for their signal-plagued VHF digital TV signal (real channel 8/virtual channel 8). It’s “Antenna TV,” a new Tribune programming service that will launch this coming January. WJW has been cleared as an affiliate, mainly owing to the managing relationship between the two companies… for now, at least. Antenna TV will offer a combination of movies and classic television shows including: Burns & Allen, Hazel, Father Knows Best, Three’s Company, All in the Family, Sanford and Son, Benny Hill, Maude, The Nanny and Married with Children. Classic television series will air overnight, including: Dennis the Menace, The Donna Reed Show and The Three Stooges. Their inaugural schedule can be seen here. The bigger question, however, is the future of LocalTV and Tribune itself… because of LocalTV’s primary owner Randy Michaels, who stepped down as CEO of Tribune Broadcasting at the end of this past week. To wit, WJW’s website was just upgraded to an newer version of the Tribune Interactive site design two weeks ago.